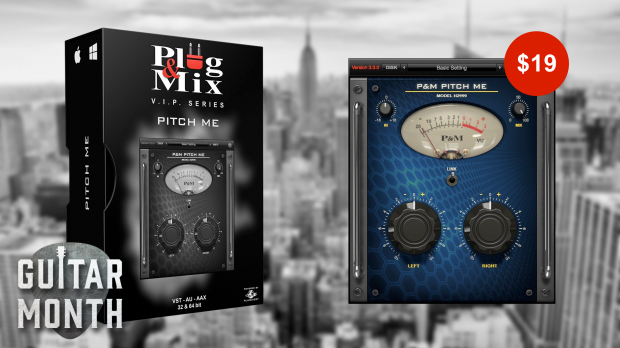 Pitch Me from Plug & Mix makes guitars sound gorgeous. In fact, it makes anything sound better and right now it is on promo at 60% off. Left – Sets the pitch amount for the left channel, in cents of a semitone. Right – As above for the right channel. Link – Links both L/R knobs for setting same value amount (opposing +/-). Offset remains as you adjust. Mix – Parallel dry/wet control for the effect. This entry was posted in DontCrack, Plug & Mix, Plug-ins, Promotions and tagged chorus effect, Eventide H910, Pitch Me, Pitch Shifter, Plug & Mix, Plug and Mix. Bookmark the permalink.